Central and South America host the most diverse bird communities on Earth. The dizzying array of antbirds, cotingas, manakins, and woodcreepers have captured the imagination of naturalists for centuries and subsequently fueled investigations into the origins of life itself. Despite sustained interest in studying the evolution and natural history of Neotropical birds, there are few long-term bird monitoring projects in Latin America. Long-term monitoring projects are necessary to estimates rates of avian mortality as well as community stability over time – two measures critical to biodiversity conservation and our understanding of life history variation. In 1996, the Klamath Bird Observatory (KBO) began their renowned training program. From the beginning, it has focused on preparing interns to conduct meaningful research projects and operate long-term bird monitoring projects irrespective of an intern’s country of origin. KBO’s internship program has become a beacon for aspiring biologists from tropical and biodiverse regions of the world. Participants are more than interns, they are part of a global family of ornithologists striving to study and conserve avian biodiversity. The impact of KBO’s training program in Latin America is unprecedented in its breadth. For example, just in the hyper-biodiverse country of Perú, successful long-term landbird and shorebird projects were all created by KBO trainees. These include Diego García Olaechea, a KBO intern that returned to Perú, collaborated with an international team of scientists to provide training workshops for Latin Americans in Perú and Brazil. 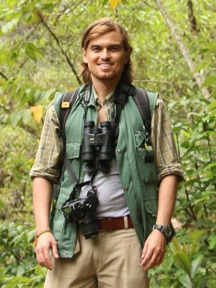 Diego also started one of the few long-term landbird banding projects in Perú and used the techniques he learned at KBO to develop exciting research ideas, leading to a prestigious Fulbright Fellowship. Diego is currently working on his Ph.D at the University of Florida. Eveling Tavera Fernandez is another Peruvian intern who learned critical field techniques during her tenure at KBO. Eveling leveraged the knowledge she gained at KBO to successfully draft and receive competitive grants from the US Fish and Wildlife Service. 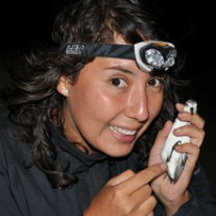 Her funding efforts manifested in an exciting long-term shorebird monitoring project—the first of its kind in Perú. Based on the skills she acquired as a KBO intern and subsequent professional success, Eveling was accepted as a Ph.D student at Simon Fraser University in British Columbia. These are just two examples from Perú. KBO has also trained interns from Argentina, Australia, Belize, Brazil, Canada, Colombia, Costa Rica, Ethiopia, Holland, Hungary, Jamaica, Mexico, New Zealand, Spain, Trinidad & Tobago, and United Kingdom. Of the 36 international interns KBO has trained, 18 actively train aspiring scientists in their home countries, which has spawned long-term bird monitoring projects in Brazil, Costa Rica, and Trinidad and Tobago. These scientists, research and conservation projects all find their origins in the internship program at KBO. Maintaining the longevity of KBO’s capacity to provision international participants with the skills necessary to serve as scientific leaders in their respective countries is critical for the conservation of global biodiversity.